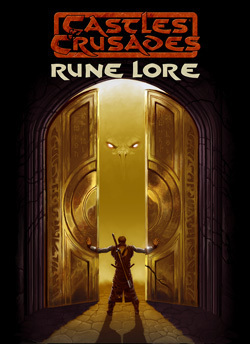 Introducing Rune Lore, an exciting new supplement for the Castles & Crusades Role Playing Game. In the crumbled ruins of ancient cities, in tombs and crypts where dead Kings lie, in the halls of libraries upon tablets of stone and vellum scrolls echo the secrets of worlds gone by. In those ruins lie written clues, faint reminisces of power and glory, unnoticed by men and elves, passed by as curiosities or riddles best forgotten. Runes, Dwarf runes, runes of power, runes that captured the language of creation are recast in symbols and glyphs pregnant with power. You've played the divine; you've wrestled with the eldritch sorcery of the arcane. Now, unravel the mysteries of the runes and magic to take your play new heights. Rune Lore takes full advantage of the Siege Engine, bringing its power to the table. Runic spells, over 40 in the book, allow you to use your imagination to bend the field of play to your will. Use the rune of fire to bring flames to life, to vanquish foes, light torches, burn fields, set wagons ablaze. Combine runes for greater effect, all this by use of the Siege Engine. The only limit is your imagination. Rune Lore is the perfect symbiosis of the philosophy of Castles & Crusades, its designers, and the world of all our collective imagination. The practicioners of rune lore are the nameless heroes who seek to master these runes, who take power in hand for the sheer glory of its mastery. They are hunters, scholars, voyagers, explorers, travelers; they are those who unravel the mysteries of the past and prophecy the future. They are the runemarks.